For accessing those notes, we updated Elcomsoft Phone Breaker to version 6.50. Why Sync Notes at All? Syncing notes with the cloud is convenient. Users can access synced notes from any Apple device they use. They can also access notes via iCloud.com from any computer (yet a trusted Apple device may still be needed to log in if two-factor authentication is enabled). Syncing notes is normal practice employed by pretty much every significant note taking app. Evernote, Microsoft OneNote, Google Keep, Simplenote and many smaller products offer their users the ability to sync notes with the cloud and across devices. None of those services are known for holding onto notes that users delete. 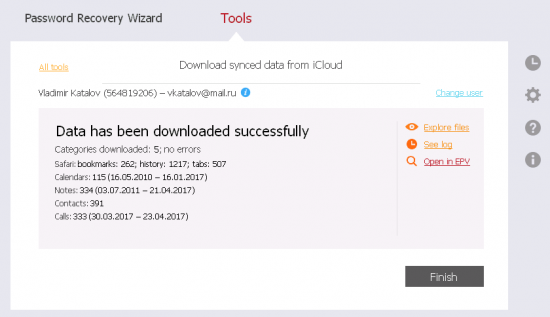 The screenshot demonstrates a number of notes, of which 2 were located in the Recently Deleted folder (and hence could be accessed through iCloud.com), but some 47 notes were deleted more than 30 days ago and were recovered by Elcomsoft Phone Breaker. These notes would not be accessible by using any other means. 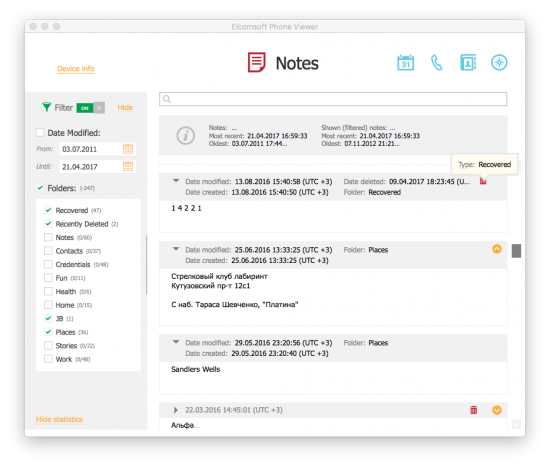 If deleted notes are stored in the cloud way past the 30-day retention period, is there a guarantee you can successfully extract those notes? Not necessarily. While some of our test accounts did indeed contain deleted notes going all the way back to 2015, some other accounts contained much less than that. 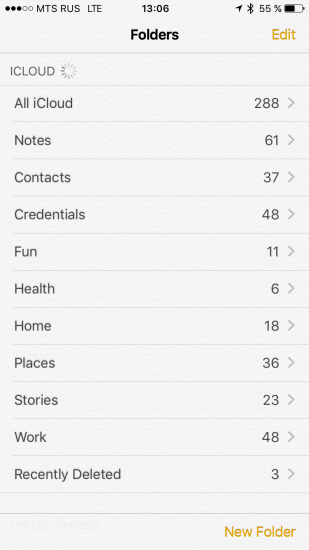 In several cases, we’ve been able to access two weeks worth of deleted notes (still, this is two weeks *after* the 30-day retention period). We need larger base to make any conclusions. Once we made a discovery about deleted photos being kept in iCloud Photo Library for years, Apple was prompt to making those images disappear. Once we discovered that Safari browsing history records are never deleted from the cloud, Apple patched that as well. There is no doubt Apple will fix the current issue. The question is: what other data you don’t want Apple to keep is still retained by the company? And does Apple actually destroy deleted records or simply hides them or moves to a different server? These questions still have no answer. 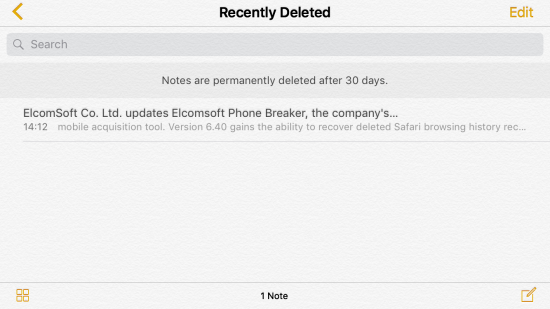 You’ll need Elcomsoft Phone Breaker 6.50 to extract deleted notes as well as the latest version of Elcomsoft Phone Viewer to view them. You’ll also need the user’s Apple ID and password (with access to secondary authentication if two-factor authentication is enabled on that account). Alternatively, a binary authentication token may be used. This entry was posted on Friday, May 19th, 2017 at 11:21 am	and is filed under Security, Software. You can follow any responses to this entry through the RSS 2.0 feed. Both comments and pings are currently closed. Where is the authentication token saved? And big thanks for all the great work you are doing! On Windows, token is stored in “com.apple.AOSKit.plist” file; on macOS, in ~Library/Application Support/iCloud/Accounts/. It is however encrypted, but Phone Breaker includes an utility to decrypt. Please create the ticket in our support system — we need more details. EPB version, Windows or macOS version, whether you have admin privileges, do you get token from local (current?) account or from the files taken from the other one, etc.